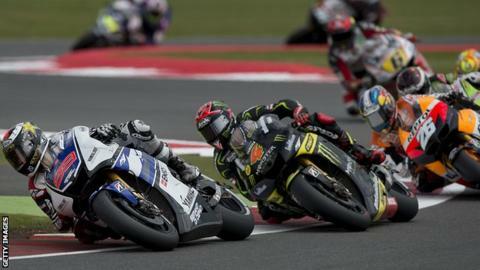 Next year's British MotoGP will take place in September, according to the provisional calendar released by the sport's governing body. The 2013 race has been pencilled in for 1 September at Silverstone after being moved from its usual June date. The calendar also sees an extra race to increase the total to 19 - though two races are still to be confirmed. They are expected to be new races in Argentina and Texas, which will both take place in April. This year's Formula 1 Grand Prix at Silverstone - which took place in July - was badly affected by rain as up to 30,000 ticket holders were urged not to attend qualifying due to muddy conditions. and the race is expected to take place at the Termas de Rio Hondo circuit. The South American country last hosted a motorcycle grand prix in Buenos Aires in 1999. The Texas race - scheduled for the Circuit of the Americas - will be the third race in the United States if it is confirmed. The 2013 season will start with the now traditional night race in Qatar on 31 March before moving on to the new races at Argentina and Texas. There will be no race at Estoril in Portugal for the first time since 1999, and the season will once more finish in Valencia on 10 November.